LONDON – Danny Boyle apparently blames the box-office failure of his film “Steve Jobs” in the U.S. on the decision by distributor Universal Studios to break it wide too early. Universal reportedly blames the film’s leading actor, Michael Fassbender, for not having enough star power to open a movie. They both miss the point that it’s simply not a very good film. “Steve Jobs” makes the assumption that cinema audiences are as in thrall to the Apple executive and his computers as the nameless and faceless throngs that pack the three product launches around which the film is structured. Boyle and screenwriter Aaron Sorkin depict a multi-millionaire who lacks charm, grace and common decency and they expect to engage our interest with no more explanation for his being a prick than that he is a “genius” and he is pained by the knowledge that he was an adopted child. Fassbender does sterling work in the title role and he is matched by Kate Winslet (pictured) as the executive’s doting but efficient marketing whiz. Seth Rogan, as Jobs’s original partner, shows up every so often to complain that while Jobs focuses on each new product he fails to credit those who worked on the firm’s most successful device, the Apple II. The question is, why should we care? Sorkin’s three-act structure is repetitive and involves the same arguments each time. The result is a talking heads film in which Jobs spews nastiness and invective to whomever disagrees with him. He softens only when a daughter he has tried to deny grows up to be a forgiving soul although Sorkin misses any irony in the effect his $440 million might have on that. It’s hard to think of another film in which the composer has to do so much heavy lifting. Daniel Pemberton’s sprightly score establishes the rhythm and tension of all the verbal confrontations that chatter relentlessly throughout the film. Without his musical crescendoes it would be difficult to tell what Sorkin’s rat-a-tat dialogue is getting at. Even with the score, it’s just men and women prattling, and that becomes tiresome very quickly. Director: Danny Boyle; Screenwriter: Aaron Sorkin; Cast: Michael Fassbender, Kate Winslet, Seth Rogan, Jeff Daniels, Michael Stuhlbarg; Director of photography: Alwin H. Kuchler; Production designer: Guy Hendrix Dyas; Music: Daniel Pemberton; Costume designer: Suttirate Anne Larlarb; Editor: Elliot Graham; Producers: Danny Boyle, Guymon Casady, Christian Colson, Mark Gordon, Scott Rudin; Production:Scott Rudin Productions, Mark Gordon Company, Entertainment 360; UK rating: 15; running time 122 minutes. 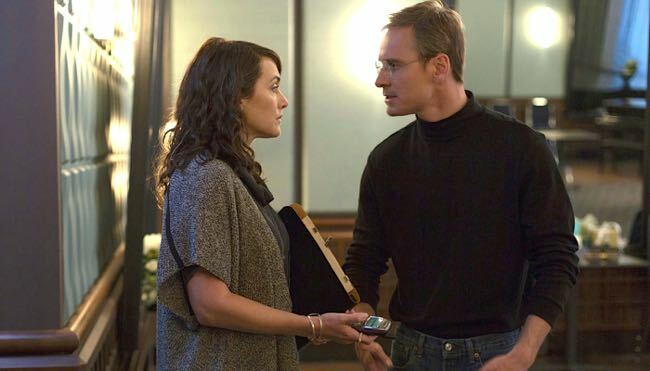 This entry was posted in Film, Music, Reviews and tagged 'Steve Jobs', Aaron Sorkin, Daniel Pemberton, Danny Boyle, Jeff Daniels, Kate Winslet, Michael Fassbender. Bookmark the permalink.